Assuming the numbers are close, is the preservation scorecard for the SD7 & 9 good or bad? What made me think about this topic was info posted to Trainorders that a former CB&Q SD9 is being moved by BNSF right now. Is there a list of preserved SD7 and SD9 units to review? Starter list of units at museums per Wikipedia. The Great Western here in Colorado has an SD9 however, it may be cut up soon. I have heard a museum was interested but the wheels are out of tolerance, the motor is needing work, the couplers need replacing, for a fact one is even missing... The last time it was moved was a little over 3 years ago, on its last move (dead in tow) from Longmont to Loveland. Another problem it has is when it had a rebuild the shop rewired it. Before it could haul 20 loads without any trouble, after it could only haul about 5. The GW had another one, the 914, but it was scrapped a few years ago. Alas, Southern Pacific SD9 #4404 is no longer on the preserved list. Some online listings still seem to show it as part of the collection (also shown as SR #197) and couldn't find anything about its disposal. The FWRHS has SD9 NKP358, currently undergoing cosmetic restoration, with the possibility of operation in it's future. Project 358, an effort to restore our historic SD9 class diesel locomotive. The project will restore the locomotive's cosmetic appearance as it ran on the Nickel Plate Road and eventually return it to operational condition. 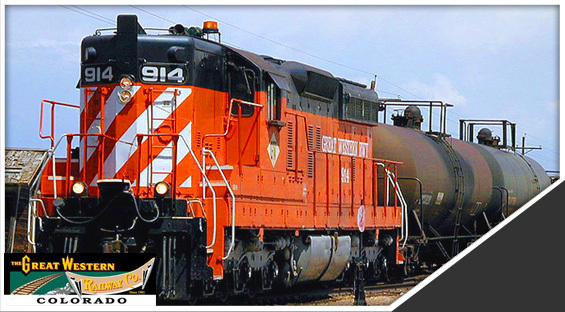 The locomotive requires about $30,000 worth of mechanical work and replacement parts. When restored, the 358 will operate with the 765 where additional motive power is needed (as in push-pull operations), for Engineer for an Hour sessions and in a variety of other uses. By the 1980's the engines were used in yard and local trains around Bellevue, Ohio. It operated for the railroad until the early 2000s and adapted for remote control use and later placed in storage. In 2010, it was donated to the railroad historical society. The photo from Colorado brings back a wonderful memory. On a summer afternoon in about '84 or '85, I was driving home from work on northbound I-5 north of Albany, Oregon. The SP main parallels the freeway for several miles there. I looked to my left and there was a brace of three SP high hood SD-9 "Cadillacs" rolling along beside me with a full train easily keeping pace with the freeway. The crew looked happy from what I could see. Great memory. SD7	Central of Georgia/SR 197, Virginia Museum of Transportation. Adding GN 558 / BN 6008 donated by Cargill to the Minnesota Transportation Museum. SOU/CofG 197 appears to be at Oak Ridge, Tennessee with the Southern Appalachian Railroad Museum collection. It certainly seems to have gained VLIX (Vintage Locomotives Inc) reporting marks on the cabside since I photographed it at the VMT in 2012 (see post #7 above) - Presumably for its move from there by rail (?) to Oak Ridge, TN. It would be interesting to see how many SD7s and SD9s are extant, whether they are considered preserved in a museum or tourist road or still working for a living. I have seen posts that there are a number of ex-B&O units out there somewhere. Let's expand this listing. Those which are not preserved could become candidates for preservation if we know where they are.